Bring us your fresh caught tuna and exchange it for Merino’s canned albacore and pay a fraction of the regular price. For Safety and quality the following are required to participate in the tuna exchange program. 1: The tuna must be bled at the time of landing the fish. 2: The tuna that you bring us needs to be whole and in the round. 3: The tuna needs to have an internal temperature of 40 degrees of less. 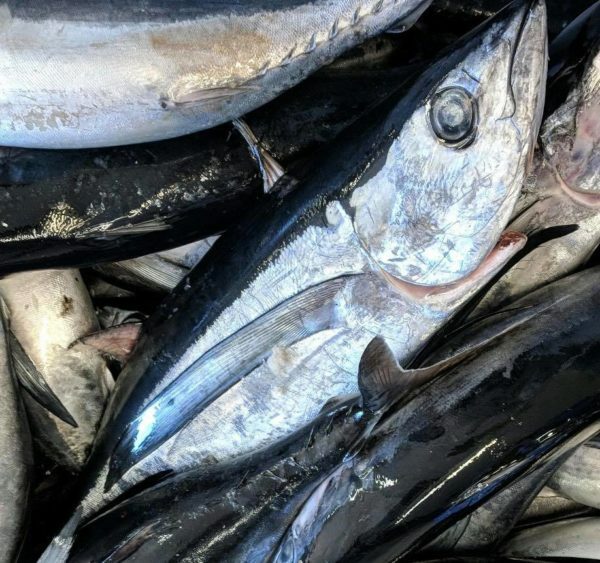 4: You will be required to complete a log of your trip information stating, fish landing times, vessel name, and that the tuna was handled correctly and stored properly during your trip. 5: If your fish does not meet these standards or appears that it was not handled correctly during the trip, we reserve the right to refuse the exchange. Remember we are going to process your tuna and exchange it with the next customer that wants to participate in the program. The following products are available, and pricing is based on the whole weight of the tuna to be exchanged. 1 pound of whole albacore tuna for 1 can of Lightly Salted for $1.95 each. 1 pound of whole albacore tuna for 1 Can of No-Salt for $1.95 each. 1 pound of whole albacore tuna for 1 Can of our flavored albacore tuna for $2.45 each. Q: When is the westport tuna season? A: Usually the tuna show up in the early summer and stick around through September. Q: Can I have my exchange cans shipped & what does that cost? A: Yes, we can ship your exchange cans for you. The cost of shipping depends on the size of the shipment. We will use the most affordable method available. Q: Do I have to exchange all of the tuna that I bring you? A: No, you do not have to exchange all your tuna. We will only take what you want to be exchanged. If you want us to process your catch you can learn more on our Custom Services page. Are you thinking of taking a Westport Tuna Fishing trip? You can check out the Westport Charter Boat Association Booking Page for Charter Information.